It’s been more than one week since the brand new Rebelle 2 was released! How has it been going for you? :) We’ve been busy doing some ‘maintenance work’ on the latest version. 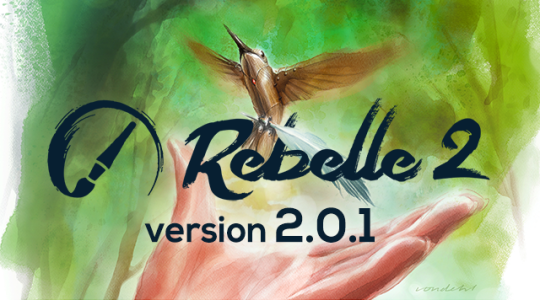 If you haven’t downloaded version 2.0.1 yet, go ahead - update is available on our Download page and is free for all Rebelle 2 users. Rebelle 1 users can upgrade directly through Rebelle 1 menu: “Help” –> “Upgrade to Rebelle 2” or via our Upgrade page. Existing owners of Rebelle 1 are eligible for more than 50% discount - regular upgrade price is $39.99. Users who purchased Rebelle 1 from March 25th, 2017 to April 25th, 2017 are eligible to upgrade for the price difference between versions, which is $29.99. Any feedback you can provide once you use the new Rebelle 2.0.1 version would be greatly appreciated.